La pagina de la "Isla del Coco"
It was like a dream when I first set foot on Cocos Island in an early January morning of 1971. A story about hidden treasure I heard months before brought me to Puntarenas, the port city of Costa Rica, lining the pacific coast. A deal of disadvantage - bartering hard work for fare, gave me the only means to the island, on a shabby boat owned by a German Fisherman. After two days on first high, than calm seas and 300 miles behind us, I made the first eye contact with the island. After the first step on the island, I was struck by a strange feeling of rejection. 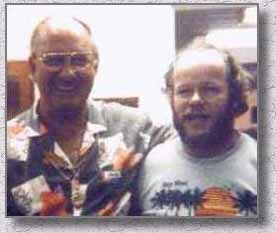 The same feeling that experienced by many previous visitors like Elmer Palliser who wrote " . . . I hated the island from the first day on," or Ginger Lamp who said " . . . a tropical hell." Map maker and Skipper Capt. Fradin called Cocos a "miserable Pig Island" by the end of the last century, but Jacques Cousteau recalled it 13 years ago " . . . The most beautiful island in the world." Would the island like me ? was the first question in my mind. During the last 25 years it proved to be a clear "Yes". One thing for sure, once you know the history and have visited this island, you get hooked to it for a lifetime. I call it -The Cocos Syndrome! Cocos Island, 24 sq. kilometers in size is a typical tropical island with two bays in the north, Wafer Bay and Chatham Bay which are divided by a ridge. The latter are a save harbor. The rest of the coastline is very step with quit a number of waterfalls, some of them 200 feet high. In the southwest of the island are the highest point, called mount "Iglesias" and 575 feet high. The Climate is hot and humid - very humid. It rains almost every day for a couple of hours between March and December. It is told, that the richest treasure in the world is buried on Cocos Island, not only one, but two major loads. The first belonged to a pirate named Benito Bonito who sailed the "Relampago," raiding every city along the pacific coast line. The second and biggest treasure was brought to Cocos by Captain Thompson in 1821. An attempt by the Spaniards to hide the wealth of Lima from Simon Bolivar and his troops. Limas Governor and the clergy entrusted the treasure to Thompson and his ship "Mary Dear" who in return killed the guards and sailed off to Cocos Island. There is even a third load, belonging to Edward Davis, Captain of John Cook's ship, the "Bachelor Delight" who left behind some loot in the late 1600's. In the last years of the 19 th. century the history of hidden pirate loot was picked up by the German adventurer and seaman August Gissler who spent 25 years on the island in an attempt to unearth the treasure. All he found was a handful of "pieces of eight's" and the remains of a golden glove. 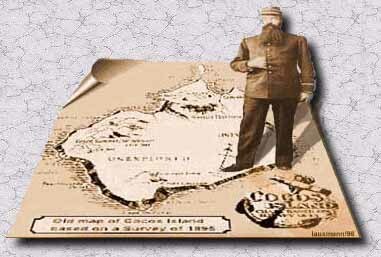 Costa Rican Government named Gissler November 1897 "Governor of Cocos Island" and promised him ownership of half the island in return for establishing a farmer's colony of 50 German families. Because of the very harsh conditions on Cocos and no working links to the mainland, Gissler failed in the attempt to maintain the colony for long. Gissler and his wife returned to the USA and died 1935 in New York. At least 300 expeditions followed him in the search for gold. The most famous names of Cocos Treasure hunters are Sir Malcolm Campbell the speed record holder, Julius Fleischman the yeast king, James A. Forbes from California and even US-President Roosevelt who allowed his crew on a fishing trip to go for the treasure. Non of them where lucky enough. Chatham Bay holds the most unique guest book of the world - hundreds of inscriptions chiseled in rocks along the tiny bay. The oldest are from the late 18th century like "His.Brit.Maj. Schr. LES DEUX AMIS - 1797", followed by dozens throughout out the 19th century and the treasure hunters of the 20th century. 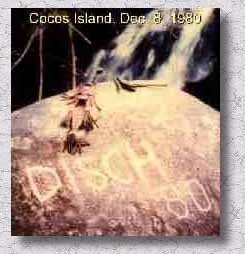 About one hundred feet inland on a boulder lining the "Lievre" river on Chatham Bay, you find my inscription "Disch 80." I chiseled it into the rock the very same day John Lennon was shot in New York. . 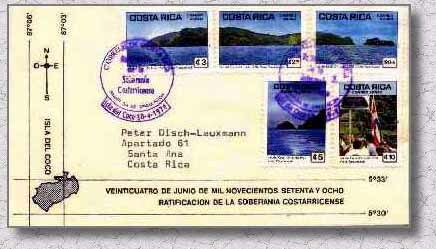 I was lucky to have had the opportunity to visit Cocos Island six times over the last 25 years. Some years ago I published in Germany a book about my researches and part of it was used for a German TV-movie titled "In search of Stevensons Treasure Island." The time of treasure hunts are gone, but the real treasure of Cocos Island is not, as the islands real treasure is its unique ecosystem - the flora and fauna not found elsewhere in the world. 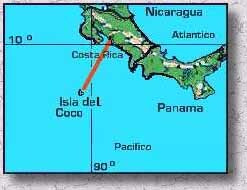 Today Cocos Island is the most sacred place in Costa Ricas extensive Park System. You need a very good reason to get permission to visit the Island. Some times diving trips are organized to Cocos. Professional divers call it the best diving site of the world. Michael Lazar of "Big Blue Underwater Video Production" has been diving and filming in the waters of Cocos Island. Click here to look at stills and an MPEG extract of his video. There is an ongoing sponsorship project called "Foundation Friends of Cocos Island." The representatives of this project are Costa Rican Ex-President Rodrigo Carazo Odio and Jean Michel Cousteau, who are respectively national and international commissioner of Cocos Island National Park. Click on icon for big-size maps! Click here for more Cocos Island readings (Bibliography), links to more information and search engine. THE CHATHAM BAY "CYBER" GUEST BOOK! - Chisel your message to the last free space left. Click here to jump to my personal page. COUNTRY INFORMATION, MAPS, DATA, LINKS, ETC. READ THE NEWSPAPER OF COSTA RICA " LA NACION"
SEARCH THE NEWSPAPER OF COSTA RICA " LA NACION"
SEND A FAX TO COSTA RICA, COURTESY OF "LA NACION"
"THE COSTA RICA CONNECTION", ALL YOU NEED TO KNOW ! More links will be added in the future. Interested in Treasure Hunting ??? Go to the Treasure Hunters Mega Pages ! Questions ? Comments ? E-Mail anytime welcome!